The Brandeis MakerLab won a blue ribbon for Editor's Choice at the 2018 World Maker Faire New York! About 10 Brandeis students and three Library staff attended the Maker Faire on the weekend of Sept. 22 and 23 at the New York Hall of Science in Queens. The Brandeis exhibit featured projects made in the MakerLab, Automation Lab and Digital Humanities Lab. 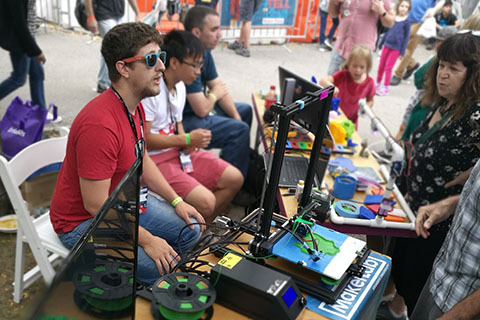 World Maker Faire New York drew an estimated 100,000 attendees in two days, and the Brandeis team interacted with more than 1,000 people throughout the weekend. This is the fourth year the MakerLab has attended this event, and the third ribbon they have won. See more images of the event and the Brandeis MakerLab team at the World Maker Faire New York 2018 blog.